So, before i start you might wonder: "What? Zios had a phantom necklace? I never heard about that before!" 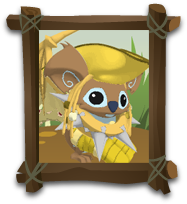 I hadn´t heard about that either until the amazing Sheesh4 posted about it on her blog, Animal Jam Insiders, about that. Click here for the post. So Sheesh4 has total credit for the idea for this story. Now, in Jam-mart-clothing, there is a little sculpture of Zios and he seems to be wearing a phantom necklace. So now that you all know what necklace I am refering to, the story can start. Grab your popcorn, although it is not that long. Zios woke up one more day from his fluffy cloud bed. His incorporeal body, just a spirit, but a spirit full of talent, gifts and imagination, felt relaxed after a reparating sleep. He lifted the golden mask that laid on his shelf, and put it on, ready to start a new day. The Sky Father hoovered down the stairs of the celestial mansion that floated over Jamaa´s sky and that he shared with Mira, his companion. He floated into the dinning hall, were Mira the Sky Mother was already eating some insects and other things that herons eat. "So, how are you, Zios?" asked Mira. "It is already lunchtime, you must have been feeling very tired last night." "Oh" was Zios´ answer. "I thought you were having yesterday. yes, I am a bit tired after having to deal with those hatefull phantoms yesterday." It was early beta. Zios had created Jamaa with Mira´s help only a few months ago. But there were already quite a lot of jammers, and some of them had mean scamming and hacking thoughts. Once, when Mira saw what mean jammers had entered the land, she started crying, and while her loved Zios conforted her, the tears had wetted her lovely plumage and fallen to the groung, were, according to AJHQ, they mixed with the elements of Jamaa to form phantoms. But, AJHQ is wrong with this bit. If they had been mixed with the elements in Jamaa, they would have the elements of nature and magic from Jamaa, and the elements of sadness and dispair, from Mira. So if it had happened like AJHQ says, then phantoms wouldn´t have been formed, because phantoms have not a single atom of nature. Probably weeping willows would have formed, and as there isn´t a single weeping willow in Jamaa, that proves that AJHQ is wrong. So Mira´s tears landed on top of a SBI television, and then bounced onto a jammer who was trying to scam another one. So really, the elements that form phantoms are sadness, dispair, evilness, shelfishness and electricity, hence the reasons phantoms are evil creatures that spread chaos, sadness ans dispair and that shoot electric rays. So, the day before Zios had had a little fight with some phantoms, with help of the alphas. But he was OK, and looked down to Jamaa. corridor, his golden mask over his head, and opened the door with his invisible paw. The Sky mother, who had finished eating, accompanied him down the white, gleaming stairs of the Sky mansion, and they both flew down to Jamaa. 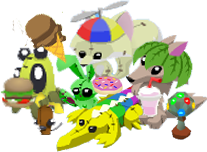 Jamaa looked normal, with Jammers chatting, playing and talking with all the guides and alphas who roamed around in beta. When jammers saw the Sky Mother and Father walking around Jamaa, they waved at them, asked them to joined their games, asked them about future plans they had for Jamaa and suggested ideas. The gods enjoyed themselves, and soon the day had ended, and Zios and Mira were sitting around the fire pit in Sarepia Forest, telling stories about the past of Jamaa with some jammers, alphas and guides who had gaddered around to listen. But there was a cloud of phantoms really near them, and the phantoms hated it when Zios and Mira got so much attention, for they loved it when people talked about them and respected them, though that didn´t happen often. So the phantoms, determined to make the group of jamaasians pay atention to them, eagerly descended and started pestering everyone. Zios, who was grand and noble and never lost his dignity, hoovered in the air in the middle of the chaotic sceene. The jammers were desparate, running to hide in the bushes and trees that surrounded the clearing of the forest. The only alphas who were there at that time, Cosmo, Peck, Greely, Sir Gilbert, Graham and Liza, tried to defeat the phantoms, and the guides helped the jammers hide. Zios said in a clear, deep voice: "Phantoms of Jamaa, let me make some things clear." The phantoms turned their heads curiously. "I created this land. I don´t want you ruining it. However, I don´t consider myself superior to you, nor to anyone, for here we are all creatures of Jamaa and we are all equal. So, phantoms, I propose we coperate. Join us and have fun in Jamaa just like all the others, and if you behave like Jamaasians you shall be treated as Jamaasians. If you wish I can use my magic to help you become jammers." But certainly, phantoms weren´t prepare to listen to the Sky Father´s speech properly or respect him. One of the phantoms, boiling in anger, shot a ray of electricity to Zios, who got stunned in the middle of his mask, and shook, trapped in a terrible elctric shock. He fell to the ground with a loud clank, and stood there, shuddering. Everyone, even the phantoms, stood there, paralised with fear, until Mira flew to him and sat next to him. "Zios" she cried. "Oh, Zios..."
The Sky Father, summoning all the strenght he had left, said: "For the ancient magic that created me that I am about to die. I would like to thanks everyone here present for making my life marvellous. Mira, I leave you in charge. All of you, please keep on improving Jamaa. Oh, and even though they have caused my eminent demise, I still think phantoms are equal to us, and still will like you to try and make them be in unity with us. And, I almost forgot, here is my will." He handed a piece of paper to Mira. "And now" he continued weakly. "My time has come. Thanks for everything, everyone. Mira, I love you." And after those final words, Zios took his final breath and died. Everyone sensed how his spirit flew up and mixed with all of Jamaa, until all that was left of him was his golden mask. That was his way of symbollizing his hopes for Jamaa. Mira, devastated, sobbed on top of his mask for the rest of the night. "First of all, if you are reading this it is probably because I am dead. Hopefully before dying I had time to say goodbye, and, once again, thanks everyone for everything. Now I shall give away my possesions. Mira, you were the best wife ever and I love you deeply. You keep my golden mask and the Sky Mansion. Cosmo, you are an incredible herbalist and your encyclopedic knowdleged surprised me often. You keep my magic seeds, my magic herbs and all my books about plants, I am sure you will find them interesting. Peck, you are a talented artist and will sucess in life. You keep my magic paints, you will create marvells with them. Sir Gilbert, you are the best warrior I have ever met. You keep my magic armor and my pearl ring. It will give you strenght and courage, although you already have a lot. Graham, your contraptions really impress me, you keep my magic tools, I am sure you will make some inventions that will really improve Jamaa. And Greely, your knowdlege about phantoms surprise me. You will help Jamaa a lot one day. You keep my notebook about phantoms. I donate all my books to the chamber of knowdlege, for jammers will find wisdom in them. I also donate the carpet from the Sky Mansion´s corridor to the chamber of knowdlege. And I want something to be done. Mira, if you are reading this or listening to me, look behind my mask." Curious, Mira looked. She found a carefully manufactured necklace symolizing some phantoms. The will said: "In life I wore this necklace on my neck. I hope you understand that I still consider phantoms equal creatures, and that wenever they agree I aprove on them being acepted as citizens of Jamaa. Please put this necklace under a small sculpture of my mask and place it somewere were lots of people can see it, to show my respect for phantoms. Now bye and good luck, everybody." After the legacies were given, Mira did what Zios had asked and placed the monument in Jam-Mart- Clothing. They also put memorials of him all over Jamaa, as well as a statue in Graham´s land, who was named the Lost Temple of Zios in the Sky Father´s honour. Then the phantoms broke it, but that is another story wich you can read by clicking here. So Zios´s phantom necklace really symbolizes how he will always approve on phantoms being citizens of Jamaa, and how he respects them and considers them equal creatures. Hope you liked that! I know I kind of went out of topic, but in order to put what Zios´s will said, I had to explain how Zios died. Your´e welcome, I am glad you like it! Sooo glad! sounds like a deal! i agree with those rules! o if you look on 1 of the tables you can see the necklace on it in the clothes store!!!!!!!!!!! I think that ZIos is an eagle, not a god, and that he has special powers and that he glows when he has strong emotions. Nobody knows what Zios really looks like, so thats why he said Zios was a spirit or some fictional god. I know, I was just saying what I think.